These are explicit comics. You must be 18 years or older to download them. Black and White, 8 pages. PDF. 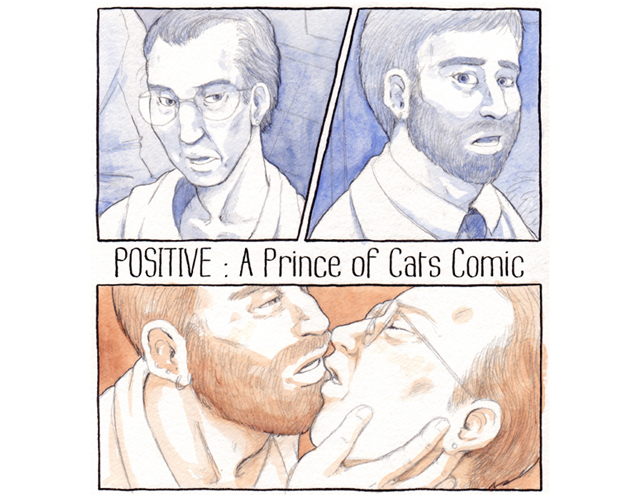 POSITIVE is a comic based on my webcomic of five years, Prince of Cats. It imagines one future where the main characters meet again, 22 years after becoming estranged after high school. POSITIVE was written for the PURITY anthology, a collection of comics in which authors were tasked to examine thier relationship to “BL” manga and create stories that built upon that relationship. I chose to write a story about middle aged adults hooking up decades after dating, and addressing the presence of HIV. For fans of Prince of Cats, I wouldn’t consider this story “canon” but rather one possible future. It’s not an epilogue, but a potential outcome. POSITIVE was originally published in 2015.